Inflammation is a normal body response that results in swelling when you have a cut or injury and a fever when you have an infection. It is a healthy reaction because it means your immune system is doing its job to fight off invaders. However, when inflammation is a chronic physical response, it can lead to problems such as persistent allergy symptoms, stiffness in arthritis and even spreading of cancer cells, according to the Johns Hopkins Newsletter. Eating certain foods as part of your regular diet can help balance inflammation in your body. Inflammation in the body produces cell-damaging molecules called free radicals. Fruits and vegetables contain antioxidants, which help protect your body from the long-term effects of these free radicals. The John Hopkins Newsletter notes that other compounds in fresh produce, such as the sulforaphane in broccoli and cabbage, also help directly suppress inflammation in cells. To get the most from the fresh produce you eat, focus on antioxidant-rich varieties, which tend to be more vibrant in color. Examples include berries, carrots, sweet potatoes, yellow and red bell peppers, spinach, kale, citrus fruits and red and purple grapes. Whereas a diet high in trans and saturated fats can promote inflammation in the body, a diet rich in monounsaturated fats can reduce inflammation, according to the Linus Pauling Institute. Foods that contain these healthy fats include olive oil and fish. Monounsaturated fats are thought to help protect against inflammation because they contain antioxidants known as polyphenols. Aim for at least two 3-ounce servings of fatty fish such as salmon and tuna, each week. To increase your olive oil intake, use it as a replacement for butter when preparing food and combine it with vinegar for a nutritious bread dip. Omega-3 fatty acids are polyunsaturated fats that are thought to help reduce the inflammatory response in the body. Flaxseeds, flaxseed oil, walnuts, walnut oil and canola oil are rich in the omega-3 fatty acid ALA. The omega-3s, EPA and DHA, are found in oily fish and fish oils, which also happen to be rich in monounsaturated fats. Omega-6 fatty acids – found in foods such as corn oil, soybean oil and animal-based foods – are also important in the diet when balanced with omega-3s. However, some varieties may promote inflammation in the body and the American diet tends to contain 14 to 25 times more omega-6 fatty acids than omega-3s, according to the Linus Pauling Institute. 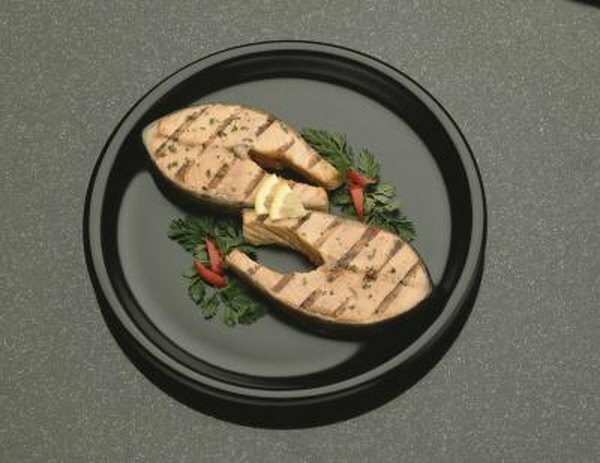 Many lean protein sources such as lean poultry, fatty fish, soy, tofu, tempeh and legumes may have anti-inflammatory properties. A 2005 analysis of information in the Third National Health Nutrition and Examination Survey found that higher intake of the amino acid arginine – found in eggs, fish, poultry and nuts – can reduce levels of C-reactive protein in the blood. This protein levels rise in response to inflammation in the body, so lower levels may suggest reduced inflammation.